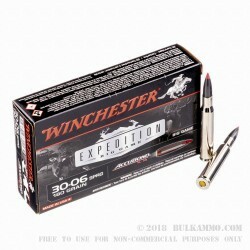 Winchester is making a bold claim with this 30-06 ammo. They claim it’s suitable, and even preferred for all North American big game including Bear. That’s how much confidence the folks at Winchester have in this load --- which is saying something given their history in the firearms and ammunition industry. 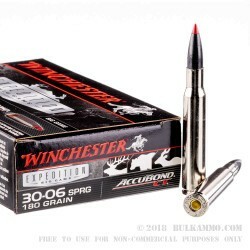 Winchester makes that bold based on the premium components, the large projectile size for the cartridge and the premium components which allow for better ignition, flight, penetration and follow up than other lesser .30-06 cartridges. Winchester concludes that it has developed the top tier cartridge in the .30-06 market and from the looks of it, they might have something of substance behind those claims. 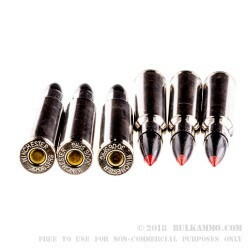 It’s priced accordingly of course, but if you cannot afford the $1400+ for a new gun and you pulled a once in a lifetime tag for a massive game animal, you can likely feel confident that your old .30-06 will be able to do the trick with this ammunition that makes 2750 feet per second muzzle velocity and 3020 ft. lbs. 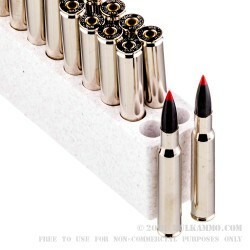 of energy at the bore and features a polymer tipped 180 grain bullet in the AccuBond range.